For many families from Maine and beyond, warm weather means a return to the cottage — or renting one — in this little-known community on the shore of Penobscot Bay. By Bruce Snider. The well-known border town hopes its glamorous new $6.6-million visitor’s center will persuade even more people to explore Maine’s easternmost county. By Patrick McManus. We don’t have grizzlies or rattlers or even catamounts in Maine, but it’s possible all the same to have an alarming encounter with wild beasts here. By Roberta Scruggs. North America’s speediest car ferry provides a glimpse of the future as it tears through the pristine waters between Bar Harbor and Nova Scotia. By Joshua E Moore. I’d always been a bit daunted by the soaring crag in the middle of Moosehead Lake, but that didn’t keep me from trying to hike it with my husband. Yet another Maine adventure by Elizabeth Peavey. Located just a stone’s throw from the ever-so-trendy Old Port, Harbor Fish Market is one of Portland’s enduring bastions of authenticity. By Virginia Wright. It’s that time of the year again when every Mainer, willingly or not, turns into a part-time innkeeper. Don’t fight it, get ready. Some helpful hints from Winnie White. For all the controversy about installing slot machines at the state’s two commercial racetracks, few Mainers have a clue about harness racing. By Jeff Clark. A wonderful old inn in Georgetown has captivated three generations of the same family — and 100 years of customers. By Christine Carson. Not far from Mount Katahdin in Baxter State Park is one of the finest campgrounds in the North Woods — and nobody knows about it. By Andrew Vietze. Opinions and observations on a certain Maine sticker that seems to be getting around Iraq, some bad news for turnpike scofflaws, and a Bangor gentleman who is looking out for his fine-feathered friends. After 153 years Maine has finally gotten out of the liquor business, but it hasn’t been easy or without controversy. By Jeff Clark. This winter’s subzero temperatures may yield some surprising benefits, according to the Bangor Daily News. Plus other editorials about a new tax on hospitals that’s actually a scam on the feds and a lawsuit settlement that threatens the blueberry industry. A stay at a historic inn gets you access to a select Scarborough strand. 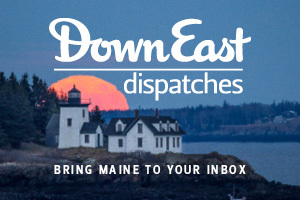 Plus pizza-to-go in downtown Rockland, a workshop for budding gardeners, a refreshing way to see Kennebunkport, and a handful of Web sites that can help you plan a Maine vacation. By Andrew Vietze. Fine dining in the North Woods — who would have thought? By Andrew Vietze. In a new book a reporter goes in search of her mother’s mysterious Maine past. By Debra Spark. A popular Maine author comes to the defense of the state’s hackneyed license-plate slogan. By David Morine. Here’s a preview of seventy-five of the festivities planned for this year’s vacation season in Maine. A striking vintage photograph recalls how the bold coast of Maine was marketed in an earlier day. By Joshua F. Moore. John Steinbeck got me into some hot water in Jonesport back in the 1970s. By Ken Textor. 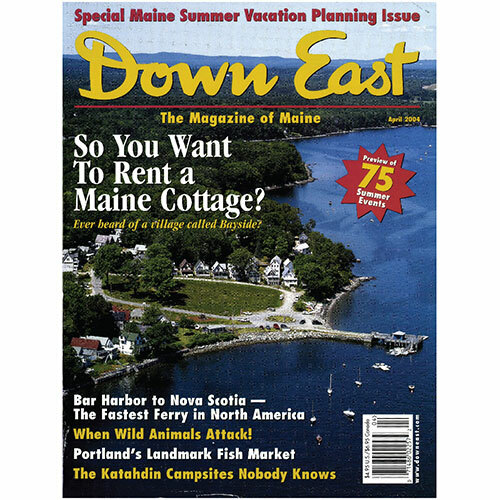 Cover: Bayside, Maine, by Benjamin Magro.